After winning her first WNBA title, Indiana’s Tamika Catchings has now done it all on the basketball court. INDIANAPOLIS, IND — As the final seconds of the Indiana Fever’s historic season ticked away, the outcome of the 2012 WNBA Finals no longer in doubt, Tamika Catchings was still playing defense. As Minnesota’s Maya Moore was set to hoist a meaningless 3-pointer on the game’s last possession, Catchings, who’s made a career out of playing harder than everyone else, actually guarded Moore and put a hand in her face. Finish it, she did. Indiana defeated Minnesota in four games giving both the Fever franchise and Catchings their first ever WNBA title. And, that all-too fitting ending put an exclamation point on what’s been an otherwise blemish-free career for Catchings. Seven All-Star appearances. Five Defensive Player of the Year honors. Three Gold Medals. One MVP. And now, a WNBA Championship. 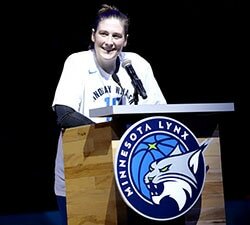 ”Everybody kept saying the one thing she doesn’t have is a WNBA championship and now it’s like it is. It’s complete,” Catchings said. Before the tears even dried from her face, this victory cemented Catchings as one of the all-time WNBA greats. Prior to tip-off, Catchings was on a list, when looking at athletes across all pro sports, with the likes of Ted Williams, Dan Marino and even Indiana’s Reggie Miller, for greatest players that hadn’t won a title. Now she’s on a much more desirable list, a list that includes John Elway, Ray Bourque and Kevin Garnett, Hall of Fame players that earned a title in the twilight of their careers while still playing a prominent role. Catchings, for her valiant efforts, was named Finals MVP  and it wasn’t a hard decision. The 33-year-old averaged 22.3 points, 6.0 rebounds and 3.5 assists in the Finals, including 25 points and eight assists in the decisive Game 4. Catchings said that the feeling of winning this championship, a feeling she’s felt on the collegiate and Olympic level, is better than she ever thought possible. And many realize how much she deserved it. “There’s not anybody that cannot be happy for Tamika Catchings to finally get a championship,” Minnesota coach Cheryl Reeve said. While this is the first championship in Fever history, its also the first professional basketball title in the hoops-crazed state of Indiana since the Indiana Pacers won the ABA crown in 1973. And like the city as a whole, over 15,000 fans showed for the clinching victory, including several Pacers players, the Fever team itself unified for this one. While credit will rain on Catchings, and rightfully so, the rest of the Fever starters did their part. Shavonte Zellous went off for 30 points in Game 3 and averaged 17 points in the series. Erlana Larkins had three games of 13 or more rebounds. 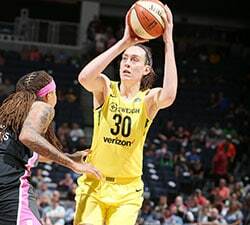 Briann January hounded Minnesota’s Seimone Augustus after she was given that defensive assignment in Game 3 and held her to 6-for-30 shooting in two games. Erin Phillips brought energy on both ends of floor, adding 18 points and eight rebounds in Game 4. In addition to wanting to win for Catchings, Fever players were motivated to win it all for veterans Katie Douglas and Tammy-Sutton-Brown as well. The trio had played a combined 35 seasons without winning a title. Understandably, it was a teary-eyed  and champagne-filled  locker room after the game. Players were congratulating and hugging each other, but one of the biggest outbursts came when they discussed that Miller, an Indiana basketball legend, tweeted about Tamika Catchings and the Fever. For Catchings, she said that Miller’s support really puts her pursuit of a title into perspective. Catchings no longer has to carry around the label as being the best WNBA player not to win the big one. And if it took Catchings this long to win it all, it just underscores how hard winning a championship actually is. How could Catchings not be smiling? 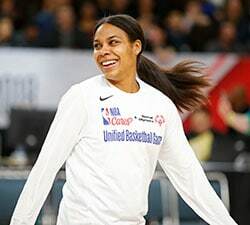 In the past 13 months, all she’s done is win her first MVP award, the other achievement she was missing, a third gold medal with Team USA, a fifth Defensive Player of the Year award, her first WNBA title and a WNBA Finals MVP. When asked if she can remember if she ever had a better year, Catchings was blunt.